If I could rename the combination of sweet strawberry and rhubarb wrapped in pie crust, I would pick sunshine pie. Sunshine doesn’t need to be oranges and mangos, tropical drinks and coconut water drunk from the shell – it can also be about more down to earth fruits picked from plants trailing the ground and dug up from my mother’s garden. The two fruits meld together, the sweet of the strawberry balancing the sour of the rhubarb, late in the season and still greenish in places. They met together on my kitchen counter, a bag of strawberries which had been hurriedly frozen a month before and a bag of rhubarb stalks gifted after a trip home. There was buttermilk in the fridge, lemons in the fruit bowl and a pie dish waiting to be filled. What’s a girl to do really? It seems silly to be posting my sunshine pie on what is effectively the last day of summer when my timeline is filled with people picking up pumpkin spice lattes early, but I’m still grabbing those sunny days where I can. I may already be in knits and coats because Glasgow said goodbye to those 20oc temperatures long ago but the sky’s still blue on occasion and the Clyde still sparkles as I run alongside it, even if the nights are already drawing in. 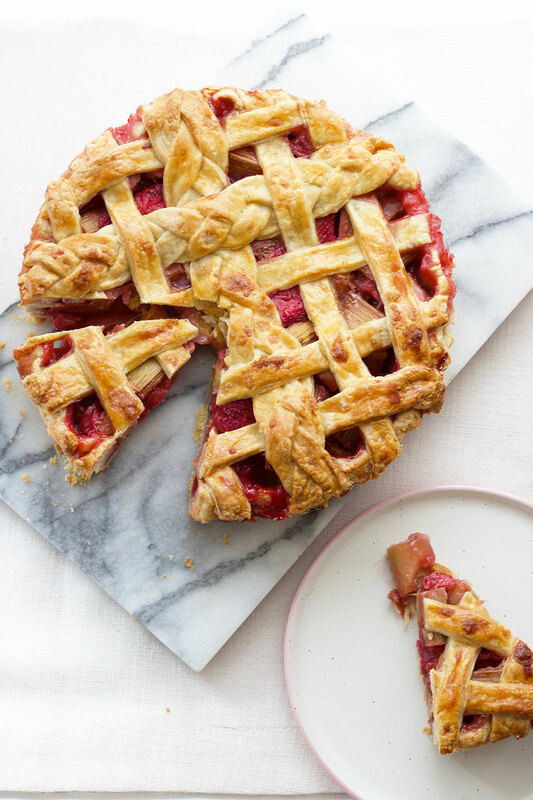 So I will keep this pie in my repertoire thank you, because a bright burst of fuschia pink fruit hidden beneath a network of lattice made from crosses and plaits is welcome when the breeze becomes a little cooler and the jumpers get thicker. I used frozen strawberries, which make the filling quite juicy when leaving the fruit filling to come to room temperature. I dumped it all into the pie filling regardless and had a bit of spillage, but nothing that didn't clean up too badly. You can always use fresh fruit if you prefer. Once roughly combined, stir through the buttermilk with a knife and bring together with your hands, adding a little flour if it feels too sticky. Divide into two and wrap in clingfilm and place in the fridge to rest for at least one hour. You can make this the day before, storing in the fridge before bringing to room temperature for around 20 minutes. To make the filling, place the rhubarb, strawberries, sugars, cornflour, lemon zest and juice into a bowl then stir to combine. Leave to one side to allow the fruit to macerate. It may become a little juicy but don’t worry - even if a little spills out of the pie while baking it will still look and taste delicious. Preheat the oven to 200oc/180oc fan as you assemble the pie. Pour the filling into the pie crust and level off with a spoon then place to one side as you make the lattice. Roll out the second pastry disc as before, cutting into 10 equal strips longer than your pie. To make the lattice, I followed the tutorial linked above then made two plaits with the leftover pastry scraps. Brush the lattice and the edges of the pie with the egg wash then place on a baking sheet lined with baking parchment and bake in the oven for 20 minutes then lower the temperature to 180oc/160oc and bake for a further 40 minutes until the pie crust is golden and crisp. Remove from the oven and leave to cool in the tin for at least a couple of hours to let the juices settle. You browned that lattice perfectly! 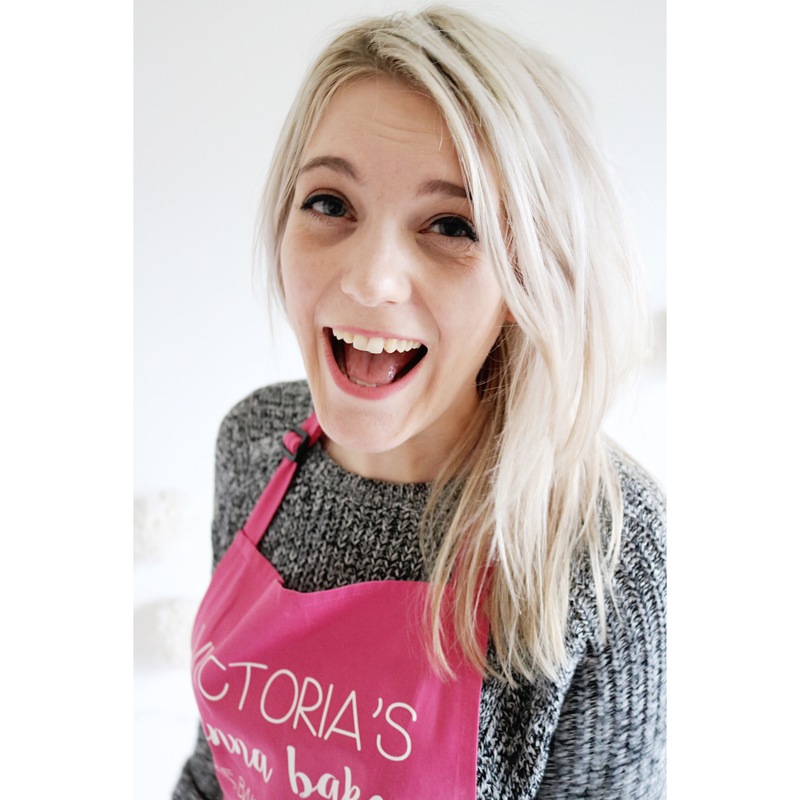 I struggle with pies – I often find that my crust gets soggy even after baking it. Do you think I’m just adding too much filling? 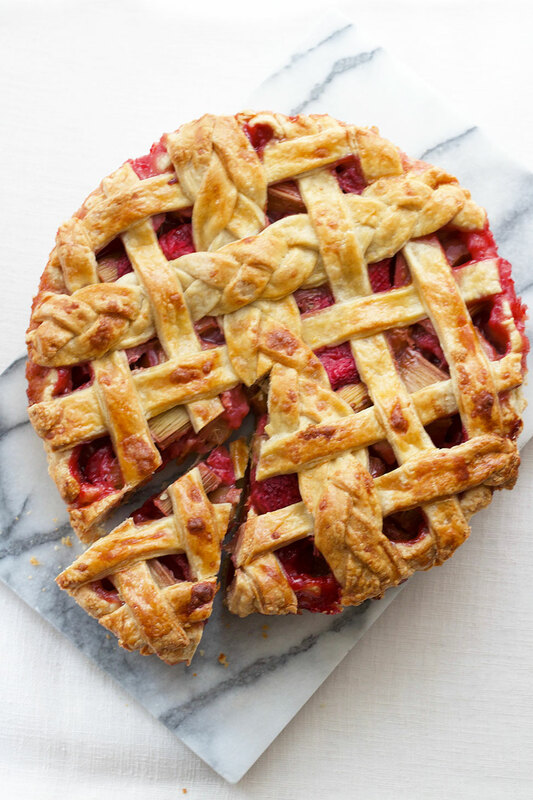 LOVE rhubarb pie, this looks delicious, by the way. Thanks Ritika! I had quite a lot of juice from my filling because I used frozen fruits which I thawed out but with enough cornflour to thicken it up, it works fine for me – even if there are a few spills! If you’re worried, you could always try separating the juices and heating until thickened like a syrup to add back to your fruit? This pie looks delish. I bet your kitchen smelled so good while these were baking! The kitchen smelled amazing, like the best kind of candle you could buy! truly scrumptious looking!! great photos and bravo! Thank you Joy, what a lovely comment! 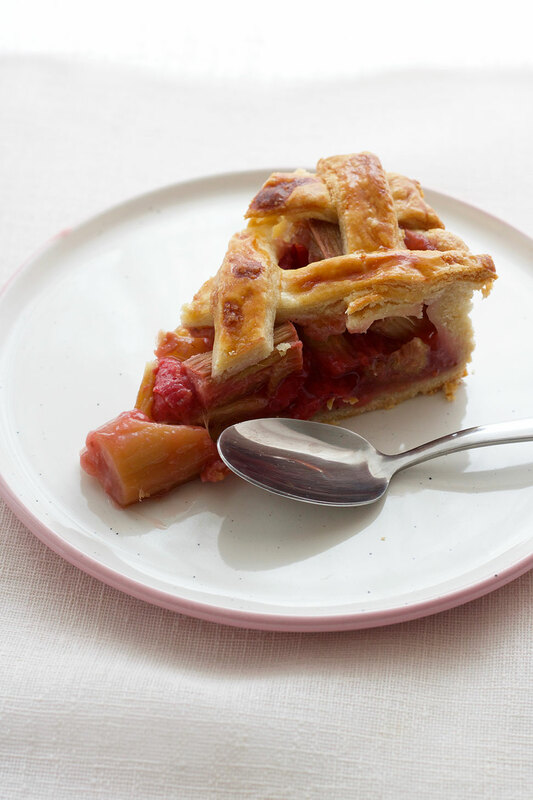 I love to get ideas on how to use rhubarb and this pie looks like ticking all the boxes. Such a treat. Delicious. so I froze a few bags to use up this Fall. That’s such a good idea! I didn’t have space in my freezer to keep any for the colder months but a pie like this would be great when it gets a bit chillier!